There are faster cars, but most of them start at $40 grand plus and some at $50 grand. Some others, well, just a few really, weigh less, but cost way more. None have AWD at this price, and some are a good deal thirstier. Here are the basics in this totally revamped model for 2015. Subaru bases the WRX on its compact Impreza sedan. Gone is the hatchback version, at least for now. That means WRX rides on a 104.3-inch wheelbase and is 180.9 inches long. Not surprisingly since this is racy, Subaru has stiffened the chassis (41% more torsional rigidity) and suspension, plus speeded up the electric-assist power steering. Subaru says this version has 67% faster steering than the previous WRX. Hard to say if it feels that much better, but steering is quick and allows you to toss the car around sharp turns with authority. There’s precious little body lean (Subaru says 20% less body roll), but numbers aside, this is a fun drive! WRX embodies speed, and the new 2.0-liter twin-scroll turbocharged, direct-injection Boxer 4-cylinder is responsive. It’s freakin’ FAST, blasting away from a stop and pushing the driver, or passengers, back in their seats. Triple digits here we come, yeow! This twin-scroll turbo feels more torquey than the previous model and still gives you some turbo whine and wash-back “whoosh” as you let off the throttle. That’s fun, I don’t care who you are! 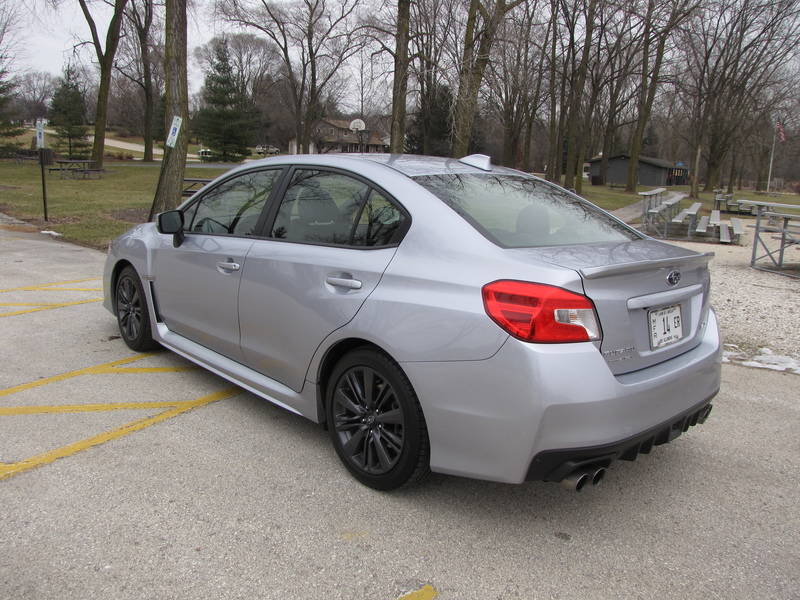 Subaru also equips the WRX with a six-speed manual transmission, up from the former 5-speed gearbox. I appreciate the extra gear and any highway gas savings it gives, but there’s no denying the gearbox is notchy, especially first gear. The main point here is that down-shifting can be a little tricky. Ride is where you know you’re in a lightweight speedster on a modest wheelbase. Ride is stiff, real stiff. You’ll feel all the bumps and tar strips. 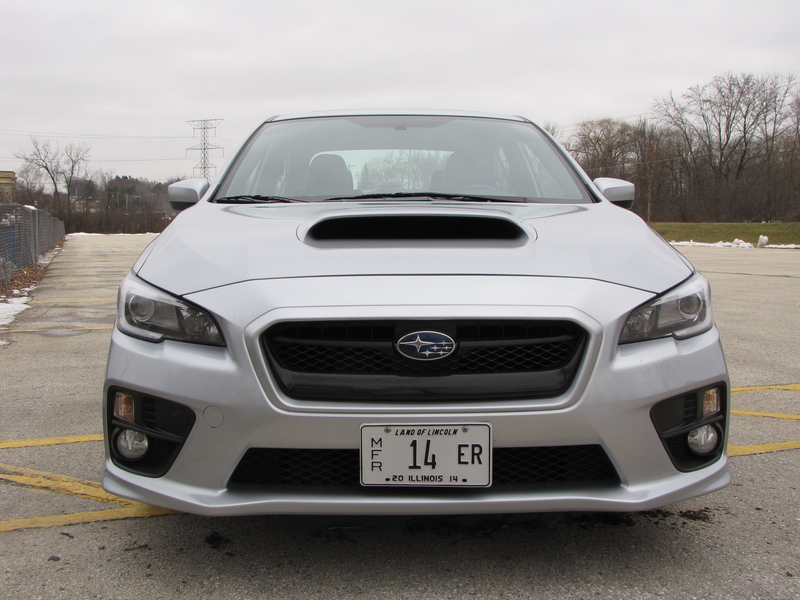 The STI, WRX’s super racy love-child version will no doubt increase derriere punishment, but for Wisconsin roads you’ll need the suspension tightened no further than what the Limited offers. Brakes here are fat discs that corral WRX’s ponies and Subaru’s noted all-wheel-drive system secures the 17-inch tires’ grip, even in sloppy weather, of which we had plenty during the test drive. Never spun a tire and never felt the car even think about side-stepping in a corner. Inside, the WRX is roomy enough that four adults will fit comfortably. Even with the seat well back on the passenger’s side a third person can fit in back without worry of losing circulation in their feet. Design of the main instruments and seats tell you this has serious sports sedan leanings, but you’ll also notice a lot of road noise from under the car and what sound like thin wheel wells. I even had a person in a parking lot say he’s found a WRX he tested to be quite noisy on the road. This one looked racy and being the Limited version in came with black leather seats standard. They are well shaped for testing the WRX’s performance. Side bolsters are well shaped and extremely large on the seat back to keep a driver or front seat passenger from sliding or leaning in a high-speed maneuver. Good gauges and love the flat-bottomed steering wheel here. Subaru includes an 8-way power driver’s seat with easy adjustments and two-level seat heat for both front seats. Those control buttons are way back on the console, behind a driver’s elbow. That makes them hard to reach, so adjustment is best made prior to driving. The steering wheel is a manual tilt/telescope model and the steering wheel itself a racy flat-bottom design with various controls on its hub. That flat-bottomed wheel looks cool and gives a driver more legroom to make entering and exiting the car easier. WRX’s dash features main gauges with red numbers and a digital speed readout between the analog speedometer and tachometer. In the dash’s center is a screen with trip computer with a toggle switch between the air vents allowing the driver to vary the screen’s appearance and information. Below the vents is a 6-inch touchscreen for the radio and map functions. Buttons on the edge of that are miniscule and the lighted channel select buttons so narrow that they are hard to use while driving. If wearing gloves, you must take them off to tune the radio. This needs serious attention to improve radio functionality and allow drivers to keep their eyes on the road. Racy-minded drivers will enjoy the red stitching around the black leather seats and leather-wrapped steering wheel, plus the fake carbon fiber trim on the dash. The test car also added a navigation system with upgraded stereo. This is a harman/kardon audio system with 9 speakers a subwoofer and plenty of power (440 watts), but no matter my adjustments it seemed heavy on the bass. 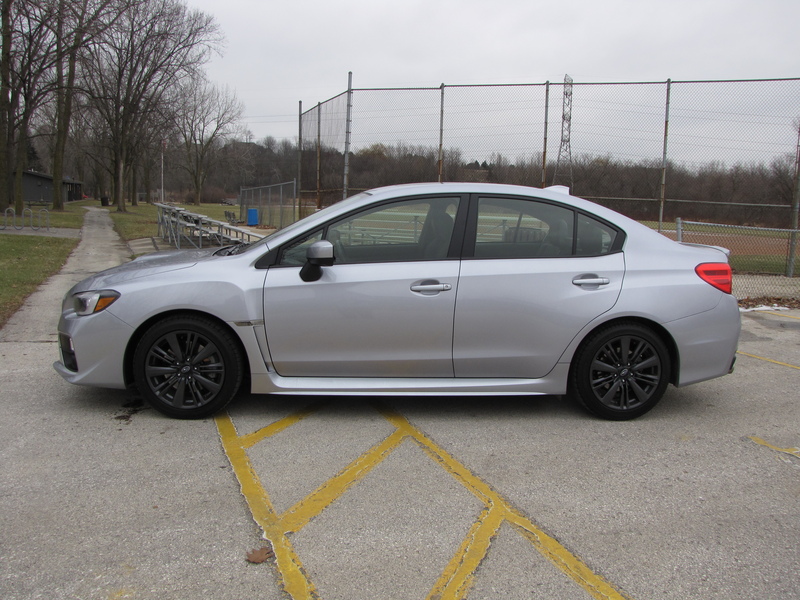 The $2,500 option also includes keyless entry and start on the WRX. Trunk space is generous at 12 cubic feet, which is good because the rear seat does not split or fold down. On another practical matter, the WRX delivers decent gas mileage, considering how much power it can deliver, and trust me, a driver can find him or herself hammering this pretty easily, especially entering a freeway. I go 22.6 mpg in about 70% city driving. The EPA rates this at 21 mpg city and 28 mpg highway and WRX prefers premium fuel. The test car with manual transmission lists at $29,995, about $3,700 more than a base model, which offers a CVT, continuously variable transmission. Yet the power is the same. Subaru also tacks on a $795 delivery fee and with the one option package the test car hit $33,290. 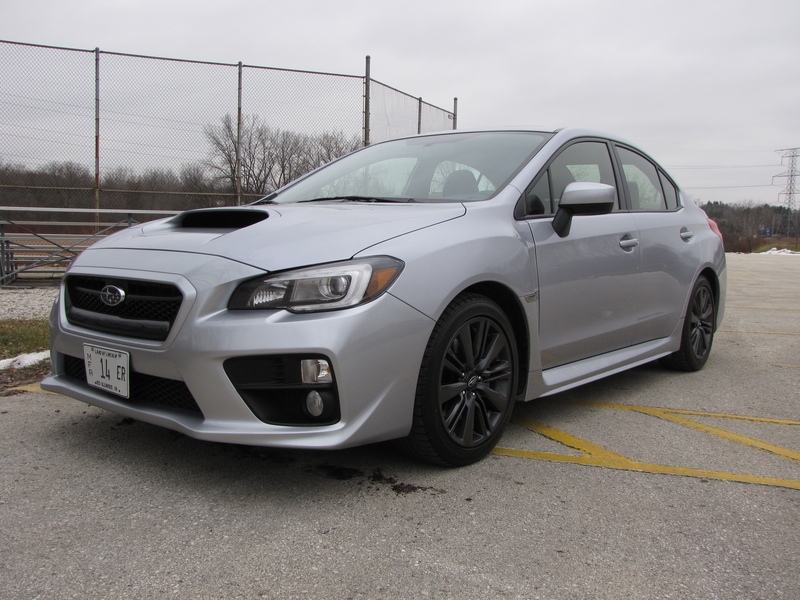 You could pay a lot more and not have as much fun driving as you will in a WRX, plus with AWD, you’ll likely keep it between the lines once the weather turns icy and slushy. Fun, even in snow? That’s a rare car commodity. Hits: FAST, quick handling sedan with all-wheel-drive. Interior is roomy with great sport seats, with heat, a flat-bottomed steering wheel and a sizeable trunk too. Decent gas mileage considering its turbo power. Misses: Stiff, stiff ride, sticky shifter and a lot of road noise inside. Tiny radio screen and channel buttons on touchscreen are hard to use while driving and when wearing gloves.